The hand might look like an X-ray from the doctor's office, but it is actually a cloud of material ejected from a star that exploded. NASA's NuSTAR spacecraft has imaged the structure in high-energy X-rays for the first time, shown in blue. Lower-energy X-ray light previously detected by NASA's Chandra X-ray Observatory is shown in green and red. Witches, ghosts and ghouls don't just haunt the Earth on Halloween night — such spooky figures exist throughout the universe, too. Here are some of the most spine-chilling space photos to scare your pants off this Halloween. HERE: This glowing, green zombie-like hand reaches through the depths of space to grab a bright-red cloud of light. Is this a giant space zombie grabbing some dinner? 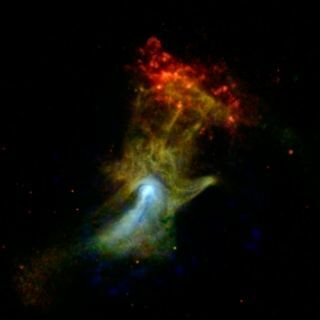 Not quite — NASA calls this nebula the "Hand of God." It is actually a pulsar wind nebula, produced by the dense remnant of a star that exploded in a supernova. Yikes! This ghastly face in space appears to be screaming while suffering through a miserable, fiery death. But no real skulls were harmed in the making of this photo. It's actually an X-ray image of cluster of galaxies known as the Perseus Cluster. Ghastly figures appear to be fighting to escape from this cloud of interstellar gas and dust called SH2-136. The illuminated dark nebula is about 1,200 light-years away, towards the constellation Cepheus. How did this skull wind up in space? A radar image of asteroid 2015 TB145, which NASA says is likely a dead comet, was captured using the Arecibo Observatory in Puerto Rico on Oct. 30, 2015. The skull-shaped asteroid flew by Earth last Halloween (Oct. 31). An ominous-looking nebula named NGC 246 lurks in the constellation Cetus about 1,600 light-years away from Earth. It is nicknamed the "Skull Nebula," but some astronomers call it the "Pac-Man Nebula." It appears to be taking a bite out of space. A witch appears to be cackling out into space in this eerie image from NASA's Wide-Field Infrared Survey Explorer, or WISE. The infrared portrait shows the Witch Head nebula, named after its resemblance to the profile of a wicked witch. This evil eye-shaped nebula, formally named Fomalhaut, strikes an eerie resemblance to the fearful Eye of Sauron from the Lord of the Rings series. In the books, Tolkien described the eye as being "rimmed with fire... watchful and intent, and the black slit of its pupil opened up on a pit, a window into nothing." Though we have yet to find any aliens on Mars, NASA did discover this creepy human face on the Red Planet. The original "Face on Mars" image was taken by NASA's Viking 1 orbiter, in grey scale, on July, 25 1976. NASA assures that the face is simply a peculiar pile of rocks — but that doesn't make it any less spooky! The Ghost Head Nebula's two flaming-hot eyes peer at us all the way from the Magellanic cloud, located about 170,000 light-years away from Earth. Its glowing eyes are star-forming regions with hot blobs of hydrogen and oxygen. This giant, red space spider is the biggest black widow we've ever seen! But don't worry — it won't bite. It's actually just a nebula, or a cloud of interstellar gas and dust. This zombie star named Tycho was once a white dwarf, or the remnants of an exploding supernova. The dead star gobbled up too much mass from another nearby star and exploded again in what's called a Type Ia supernova.